Virtual reality firm Jaunt has launched a publishing program to allow professional VR creators to publish their content directly to the Jaunt VR app. 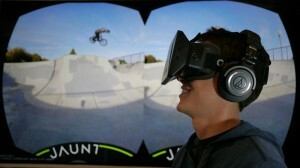 Jaunt Publishing lets VR content makers submit their work through an online portal on the company’s website. It will then be vetted by an internal review board and, if approved, published across Jaunt platform. Approved creators will have access to Jaunt Cloud Services (JCS), Jaunt’s cloud-based VR production software suite, which includes support for spatial audio formats like Dolby Atmos and processing and preparation for distribution on different VR headsets and devices. “It’s great to be able to provide a creative outlet for content creation in VR. We’re excited to be able to work with more of the VR creative community to showcase the high quality VR experiences they’re making,” said Jaunt’s CTO, founder and interim CEO, Arthur van Hoff.